Premier League: What a strike by Egyptian Mo Salah! Premier League 2018-19: It is one of the most effective left foot in the business and Mo Salah gave fans a glimpse of that once again when he struck a left-footer from outside the box in the 53rd-minute to find the top of the net. It was undoubtedly one of the very best strikes you would have seen in the season thus far. The Egyptian ace picked the ball up on the right of the Chelsea box in the 53rd minute, around 25-yards from goal, and arrowed a rasping, unstoppable drive beyond goalkeeper Kepa Arrizabalaga to secure a 2-0 victory and three precious points. The result puts Liverpool back atop the Premier League table, two ahead of a Manchester City side that defeated Crystal Palace 3-1 earlier in the day. Chelsea twice came close through Eden Hazard in the second period, the Belgian striking the post before being denied by Alisson in the Liverpool goal. Courtesy this emphatic win over Chelsea, Liverpool’s hopes of winning the Premier League title for the first time in 29 years are very much alive. Sadio Mane opened the scoring for the Anfield club with a back-post header shortly after halftime. 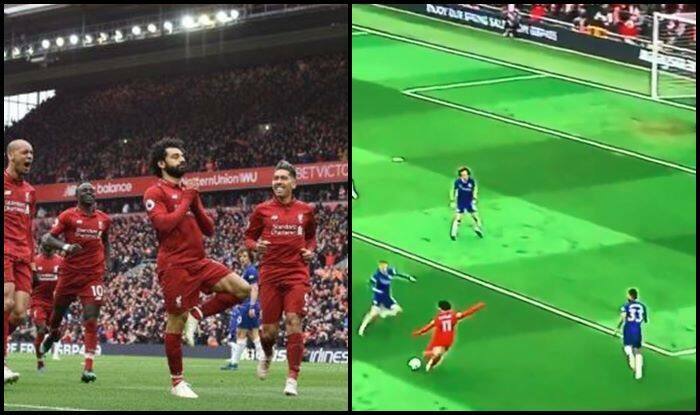 But it was Salah who provided the game’s outstanding moment and arguably one of the goals of this Premier League season. Chelsea Playing XI: Arrizabalaga, Azpilicueta, Rudiger, David Luiz, Emerson; Kante, Jorginho, Loftus-Cheek; Hudson-Odoi, Hazard, Willian. Substitutes: Caballero, Christensen, Barkley, Kovacic, Giroud, Pedro, Higuain.